WASHINGTON (CNN) -- Vice President Joe Biden said Thursday morning he has advised his family to avoid "confined places" such as aircraft, subways and classrooms because of the swine flu risk. 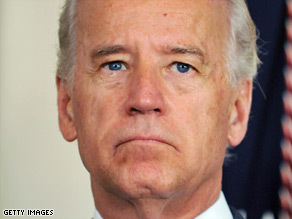 Vice President Biden on Thursday said people should avoid "confined spaces." Biden made the remarks on NBC's "Today Show," after he was asked what he would tell a family member about traveling to Mexico, where the first cases of the virus -- technically known as 2009 H1N1 -- were detected. The Centers for Disease Control and Prevention in Atlanta, Georgia, is advising people to avoid nonessential travel to Mexico, where the Mexican government suspects 159 deaths have resulted from the infection, most of them in or around Mexico City. Only a fraction of those cases have been confirmed. "The CDC is concerned that continued travel by U.S. travelers to Mexico presents a serious risk for further outbreaks of swine flu in the United States," the agency says on its Web site. "I would not be, at this point, if they had another way of transportation, (be) suggesting they ride the subway. ... So from my perspective, what it relates to is mitigation. If you're out in the middle of a field and someone sneezes, that's one thing, if you're in a closed aircraft or closed container or closed car or closed classroom it's a different thing." Roger Dow, president and CEO of the U.S. Travel Association, responded to Biden's comments by saying, "Americans should heed the advice of medical experts when determining how best to manage health concerns during the ongoing swine flu outbreak. Will I get swine flu? In a written statement, he noted that according to the CDC "and countless other experts, swine flu should not discourage people from traveling to or within the United States." "Elected officials must strike a delicate balance of accurately and adequately informing citizens of health concerns without unduly discouraging travel and other important economic activity," he said. The Travel Association is a "political liaison" for the industry, and markets all modes of travel. Not long after the "Today Show" aired, Biden released a statement through his spokeswoman, Elizabeth Alexander. "If they are sick, they should avoid airplanes and other confined public spaces, such as subways. This is the advice the vice president has given family members who are traveling by commercial airline this week." The statement also refers to advice President Obama gave to Americans on Wednesday night. He said they should take the same steps to avoid swine flu that one would take to prevent any other flu: keep hands washed, cover your mouth when you cough, stay home from work if you're sick, and keep sick children home from school.